Faster ­ The Dustless Blaster can strip a car in under 2 hours. Minimal Dust ­ The abrasive gets trapped in water and grounded, eliminating the plume of dust. 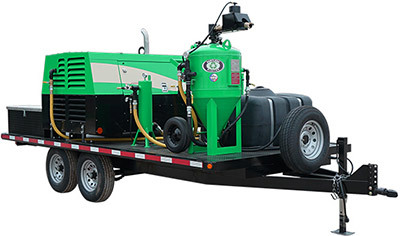 Lower Abrasive Consuption ­ The Dustless Blaster uses less media to do more work. Abrasive Flexibility ­ The Dustless Blaster can use almost any abrasive that sinks in water. No Warping ­ The water prevents friction and won’t warp thin metal like sandblasting will. Safe for Workers ­ Recycled bottle glass contains no free silica, the leading cause of silicosis. Less Containment Needed ­ In most cases, expensive, time consuming containment doesn’t need to be set up. Doesn’t Affect Nearby Workers ­ Never sacrifice productivity, other workers can work nearby unaffected. Leaves a Paint Ready Surface ­ The rust inhibitor decontaminates the metal leaving a clean, chloride free paint ready surface.